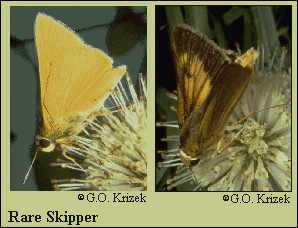 Identification: Upperside is yellow-orange with black borders, which are wider in the female. Underside of forewing is yellow-orange with black on the lower outer edge; hindwing is yellow with no markings. Flight: Two broods in May and July-September; possibly one brood in the north. Adult Food: Nectar from flowers of pickerelweed and swamp milkweed. Habitat: Brackish river marshes and abandoned rice paddies. Range: Isolated populations along the Atlantic Coast from southern New Jersey and Maryland south to coastal Georgia. The range was extended into New Jersey during the 1980's.